﻿After standing in front of Revlon's new display for their Pacific Coast Collection (by Gucci Westman), I ended up finally deciding on which Lip Butter to purchase. I think it's built into me to by neutral tones for lips. This time around I decided on Wild Watermelon! Going out of my comfort zone because I did not know how this would look on my vampire like skin. Haha, wait I don't sparkle, I swear! Color Burst Lip Butter by Revlon is a buttery balm with beautiful shiny color to give you baby soft, healthy glowing lips 94% of women felt lips were softer, smoother, and instantly hydrated. 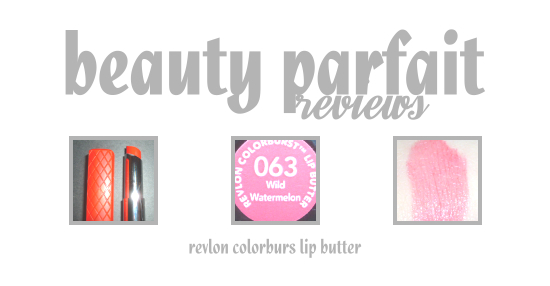 Formula/Texture: Like all of Revlon's Lip Butters, this is definitely smooth and, well buttery. From the previous ones I used, this one is probably the most pigmented when it's built up. But it does go on slightly sheer. Color: Wild Watermelon, I'd describe it as a pinky-red (with a blue undertone). Not quite pink and not quite red, it's in between the colors. Overall Verdict: I absolutely love, love, love the color. Perfect for Spring/Summer. It wears off quickly though so, I usually end up looking like I have the lip liner left on my lips that I didn't use. This normally calls for the need of reapplication more often then I should have to be doing so. Even when it does wear off, the lips still feel like they have the product on them despite the color being gone. I love Revlon's lip butters and I still have to get to my drugstore soon to check this new line! That color looks good on you, very Spring color! Dying to get my hands on Wild Watermelon!! I really like your blog! I found you on the Monday Beauties Blog Hop!! Here's my link if you wanna check it out and follow back!